It is the duty of the employer to evaluate and maintain the adequacy of any workplace personal protection equipment (PPE). This is a very important task that should not be taken lightly in case the supplier has offered PPE that fails Australian safety standards. You should never assume that equipment is adequate just by looking at it. Employers should be especially wary of products that are made overseas and may not be subject to the same Australian minimum testing standards. In a 2014 Safe Work Australia Statistics Report, body stressing, falls, trips & slips and impact by a moving object were the mechanisms of work-related injury that caused 75% of serious workers’ compensation claims in 2011-2012. 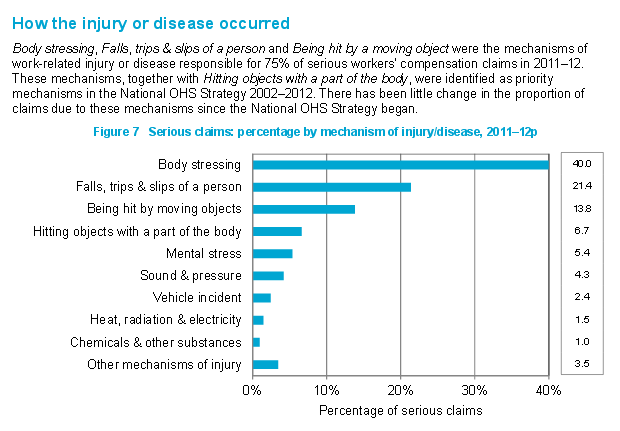 2014 Safe Work Australia Statistics Report – Percentages of serious claims injuries in a workers compensation claim. If you are entrusting your life and wellbeing to a piece of equipment, it makes sense to do your research into the manufacturer. Ask them what fundamentals you need to be aware of in order to make sure that the PPE you are using is sufficient. Make sure that your employer is up to date with all of the exact specifications and details of the equipment. Do you check your equipment prior to every job? Once you have been properly educated in the usage and maintenance of your PPE, it is important to regularly check your equipment for wear and tear before using it for a job. Is the equipment second hand? An employer may be tempted to cut costs by purchasing used PPE. While this may not seem like a significant issue, you should ask yourself “Do I know what this equipment has gone through?” If a harness was left out in the rain for prolonged periods, its integrity might be compromised. A hard hat’s shell may be weakened by UV rays if left in the sun for too long. Another problem is that this equipment may not come with an instruction manual, which may be the difference between life and death if the situation arises. As previously mentioned, equipment should be branded with a suitable certification mark, an Australian Standards reference (such as the Five Ticks) and have the organization name, date of certification and a certification license number. If your current equipment lacks any of these, bring this issue to the attention of your employer and replace it with equipment that meets Australian standards. When it comes to your wellbeing, now is not the time to lie about your size. Equipment that is too loose or too tight may be disastrous if an incident arises. Make sure that equipment fits accordingly and bring this issue immediately to the attention of your employers if an appropriate size is not available. An employer who has failed to protect their employees risks liability in negligence and opens up their employees to a workers compensation claim. Employers have PPE requirements to make sure that the equipment is safe for usage and effective in the event of an incident. The responsibility for an employer to provide suitable PPE is not a responsibility that an employer should take lightly, nor one that they can afford to take a risk. The costs can be substantial for both the employer and employee. Has your employer failed to provide adequate personal protection equipment? Or was the equipment they provided faulty or failed to meet Australian standards? Did you try to inform your employer about inadequate PPE and they failed to follow up with your concerns? Were you injured as a result of your employer’s failure to properly maintain or provide their workplace PPE? Let a Brisbane personal injury lawyer know right away if you have any questions concerning your legal rights. If you would like to START RIGHT AWAY and take advantage of a free, no obligation consultation, then contact us or fill in our case review form.